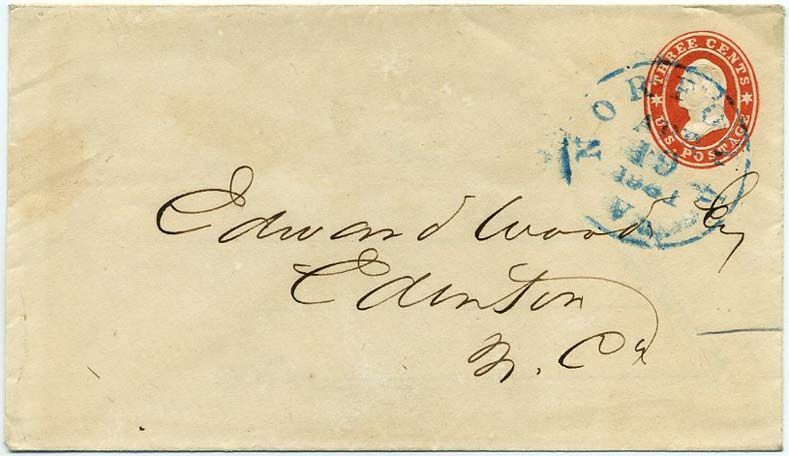 US U27, 3¢ star-die entire tied RICHMOND / Va. // APR / 30 / 1861 cds, pristine watermarked USPOD entire addressed to Mr. Edward Wood, Edenton, N. Carolina; Scarce Independent State Use (only independent for 20 days), CCV $250. Extremely Fine. Ex Thayer. $300. Hayes Plantation (or Hayes Farm) is a historic plantation near Edenton, NC that belonged to Samuel Johnston (NC Governor 1787-89) Much more information on linked page. US 26 or 26a, 3¢ dull red (type IV cannot be determined – trivial defects) tied RICHMOND / Va. // MAY / 4 / 1861 cds on pristine cover; Scarce Independent State Use (only independent for 20 days) addressed to Dr. J. S. Davis, University of Va. Dr. John Staige Davis was a Professor of Anatomy and Medicine at UVA and intermarried with the Blackford, Landon and Minor families as well as a direct descendant of the famous Washington family. Much information to be found online. Ex Thayer. $250. 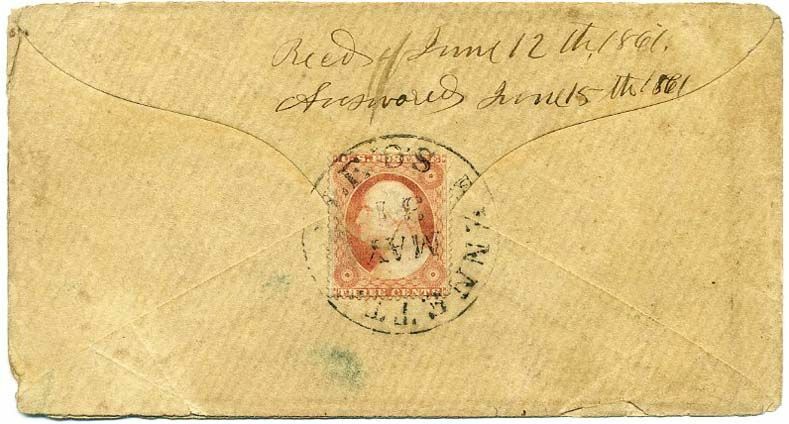 US 26 or 26a, 3¢ dull red (type IV cannot be determined as is top right margin – small defects) tied RICHMOND / Va. // MAY / 5 / 1861 cds on clean cover; Scarce Independent State Use (only independent for 20 days); addressed to Col. A[ndrew] McAlister, Suffolk, Va. The Suffolk Va. Masonic Lodge is named after McAlister. Ex Thayer $250. 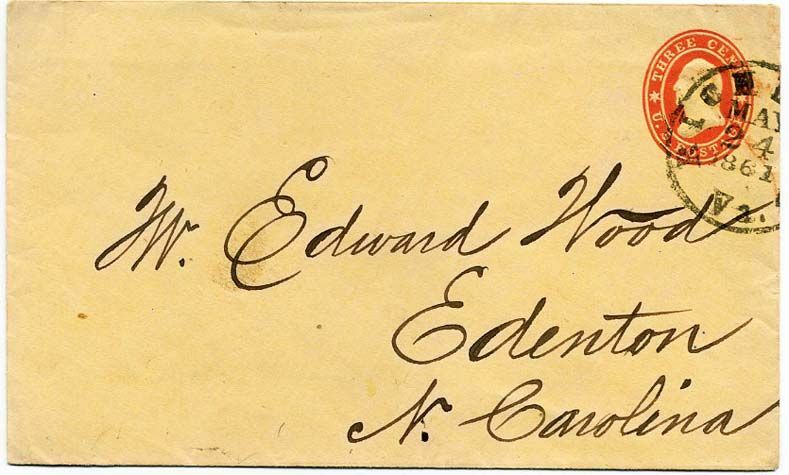 US U26, 3¢ star-die entire tied blue NORFOLK / Va. // APR / 23 / 1861 dcds on fresh USPOD watermarked entire addressed to Edwd Wood Esq, Edenton, N.C. Scarce Independent State Use (only independent for 20 days), Ex Thayer. CCV $300. $300. 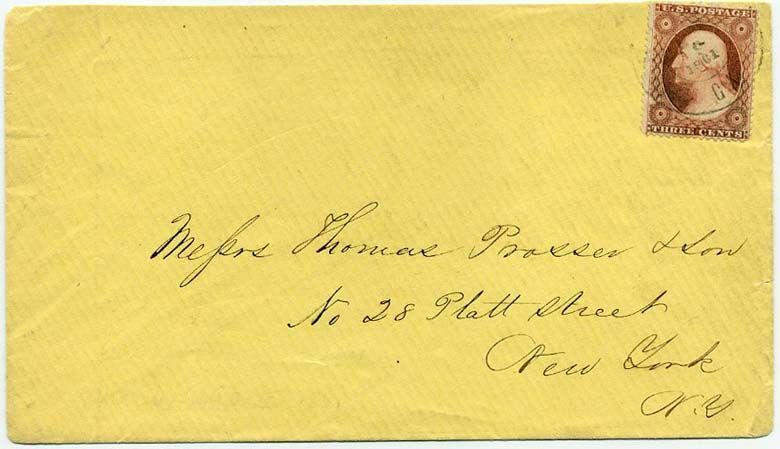 US 26, 3¢ dull red tied lightly struck EATONTON / GA // APR / 9 / 1861 dcds on cover addressed to Messrs. Thomas Prosser & Son, No. 28 Platt Street, New York, N.Y.; some mounting adherence on back flap. Confederate Use of US Postage. CCV $200. $160. US U27, 3¢ star-die entire tied grid with matching FARMVILLE / Va. // MAY / 27 /  cds on clean USPOD watermarked entire addressed to Dr. Henry A. Mettauer, Macon, Georgia. Confederate Use of US Postage (only 3 weeks possible). CCV $300. Mettauer was an eminent surgeon and botanist. Detailed medical and military biography from unpublished database, included with lot courtesy Hambrecht & Koste biographical register of physicians who served the Confederacy in a medical capacity. $250. Dr. Henry Archer Mettauer (1826-1913) was a surgeon with the 6th Georgia, Maj. M.A. Rowland’s Battalion Conscipts, Staff of General A.H. Colquitt. Much more information on linked page. 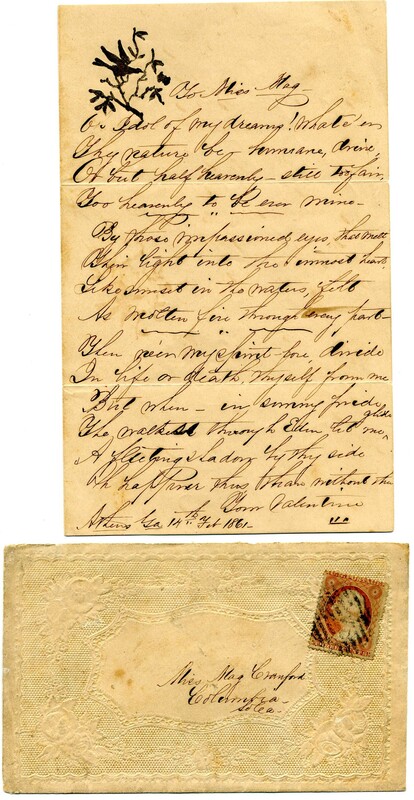 US U27, 3¢ star-die entire used with manuscript cancel of “Clear Branch Va / April 25 ”, addressed to Bettie D. Booker, Sunny Side, Cumberland County, Virginia with senders note at lower left “N.E.P.B.” (unknown meaning, perhaps initials of another Booker), edge tear at top into postmark but not readily apparent, slightly reduced at left. Independent State Use (only independent for 20 days). Scarce small town use. CCV $300. Ex Thayer $250. 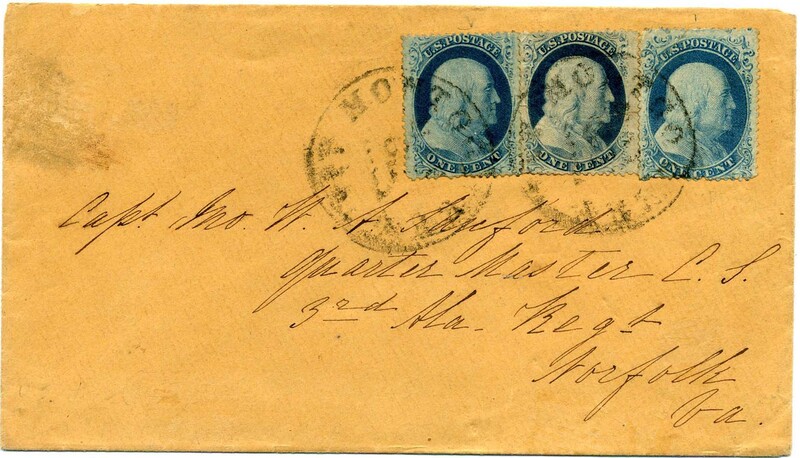 US U26, 3¢ star-die entire tied large blue NORFOLK / Va. // APR / 19 / 1861 cds, nicely watermarked USPOD, addressed to Edward Wood, Edenton, N. Carolina; Independent State Use (only independent for 20 days and this just shortly after secession), CCV $250. Extremely Fine, Ex Thayer. $300. 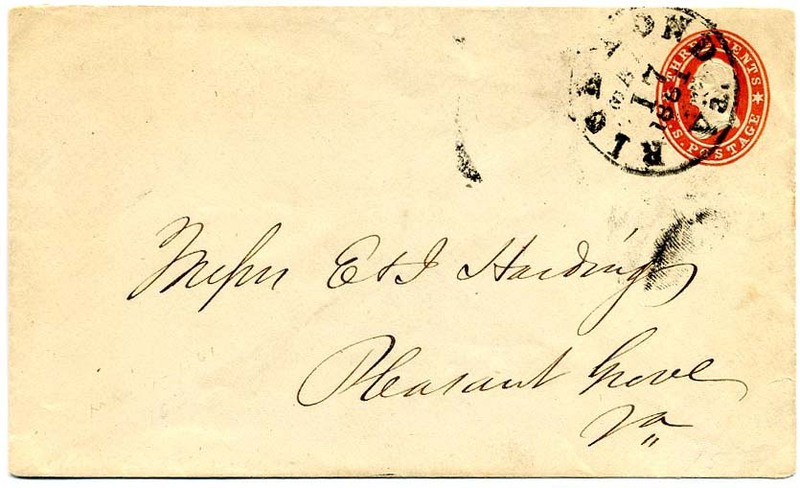 US U27, 3¢ star-die entire tied RICHMOND / Va. // MAY / 11 / 1861 cds, pristine watermarked USPOD entire addressed to Mr. Edward Wood, Edenton, N. Carolina; Confederate Use of US Postage (only 45 days possible), CCV $200. Very Fine, Ex Thayer. $300. US 26, 3¢ dull red tied RICHMOND / Va. // APR / 26 / 1861 cds on clean cover to R. D. Buford Esq., Liberty, Va. from John Goode, Jr. (docketed up the left side), fresh, slight wrinkling and tiny tear at bottom otherwise Very Fine. Independent State Use (only independent for 20 days). CCV $250. $200. 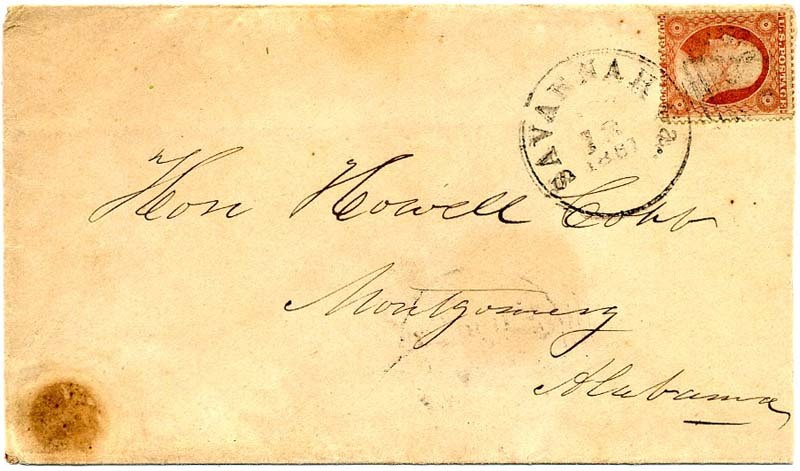 “Manassas Ga / May 12 ” manuscript postmark with matching [paid] “3”, UNLISTED in the CSA Catalog, addressed to “Hon. Howell Cobb, Montgomery, Ala.” who was at that time presiding over the Confederate Provisional Congress. Montgomery was the first capital of the Confederacy. Extremely Fine Confederate Use of US Postage. $300. 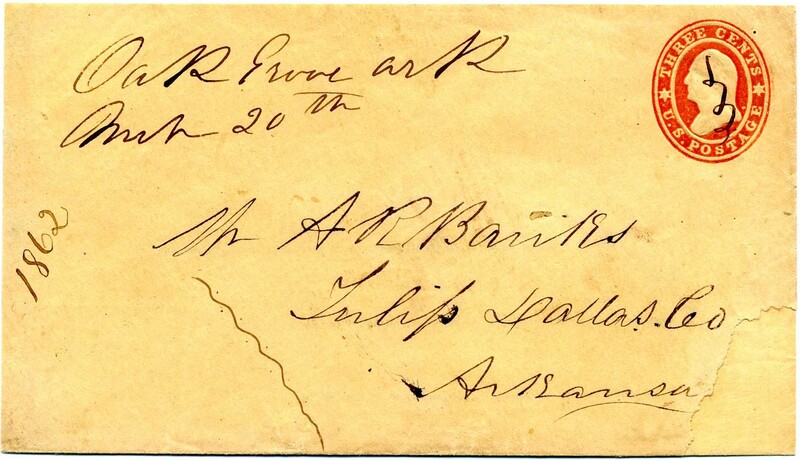 US #26, 3¢ dull red tied beautifully struck BENNETTSVILLE / S.C. // MAY / 31  cds on back flaps of cover addressed to Mr. William R. Abernathy, Lenoir, N.C., with two blue receiving cancels of Lenoir dated both Jun 5 and Jun 10 – we can only speculate for what reason they are different dates. 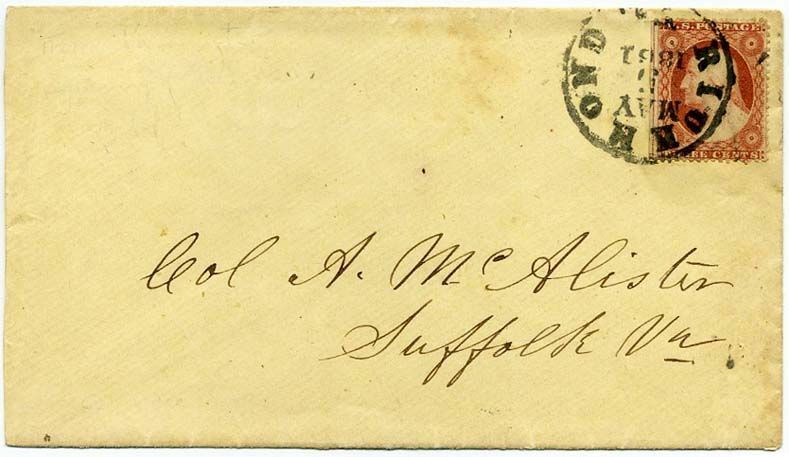 Docketing on the back with the stamp shows “Recd June 12th 1861 / Answered June 15th 1861”. It is possible that the letter was advertised for collection in the local paper on June 5 and again June 10. LAST DAY of Confederate Use of US Postage. A wonderful example of a KEY DATE for any Confederate collection with an unusual twist on the dates. $750. 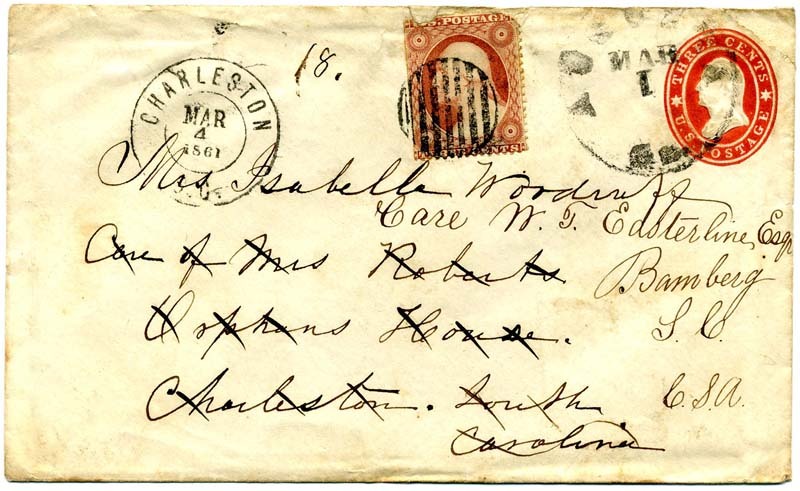 US 26, 3¢ dull red tied grid with matching CHARLESTON / S.C. // MAR / 28 / 1861 cds on folded business letter dated March 26th to Honbl Wm. Elliott, Adams Run, SC from W. C. Bee & Co. regarding sale of rice and cotton. Confederate Use of US Postage. The Confederacy took over their own postal affairs a few days later on June 1, 1861. Faint filing crease at top across stamp otherwise Very Fine, nice clean use. $200. 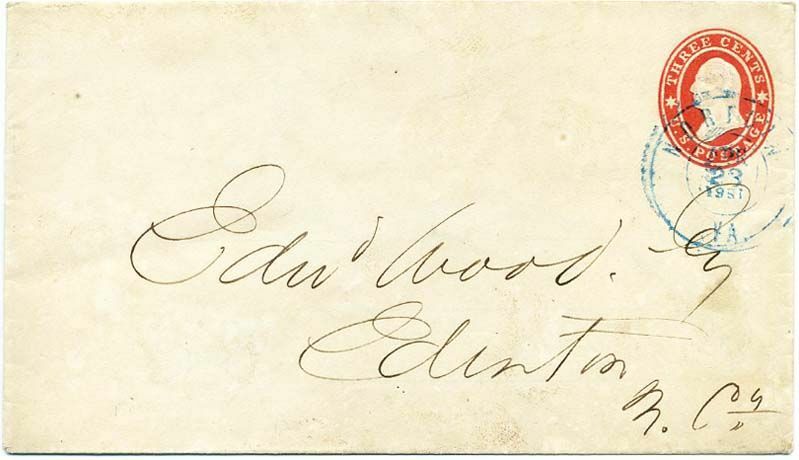 US U27, 3¢ star-die entire tied RICHMOND / Va. // MAY / 24 / 1861 cds, pristine watermarked USPOD entire addressed to Mr. Edward Wood, Edenton, N. Carolina; Confederate Use of US Postage (only 3 weeks possible), CCV $200. Very Fine, Ex Thayer $275. Hayes Planation (or Hayes Farm) is a historic plantation near Edenton, NC that belonged to Samuel Johnston (NC Governor 1787-89) Much more information on linked page. US U27, 3¢ star-die entire used with manuscript cancel of “Shady Dale [GA] Jay 29 ”, addressed to Josie B. Atkinson, Madison, Geo. ; docketing as received Feb 3, 1861 (day before Confederacy formed), Independent State Use, UNLISTED IN CSA CATALOG. $300. US U27, 3¢ star-die entire tied grid and matching boldly struck neat SAVANNAH Ga. // FEB / 15 / 1861; fresh entire addressed to S. F. Dickinson, Macon, Geo; Extremely Fine Confederate Use of US Postage. $250. 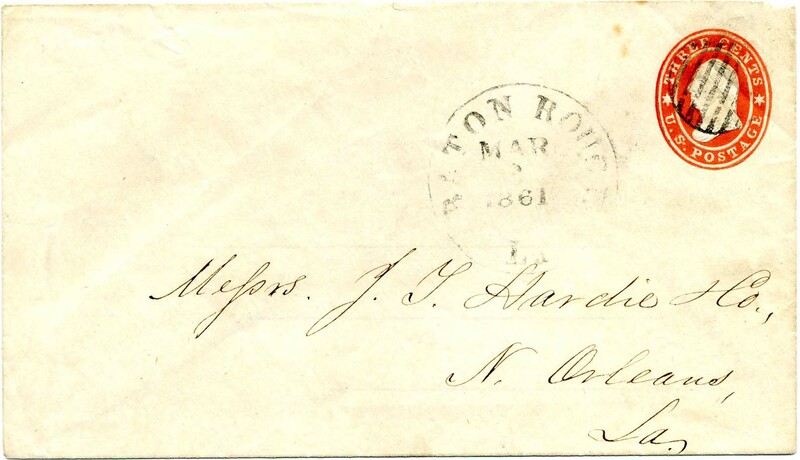 US 26, 3¢ dull red tied fancy CANTON LYRE with Apr 4, 1861 town cancel on cover to Carroll Hoy & Co., New Orleans with the usual pin holes. Particularly choice strike of this scarce and popular cancel, CSA Use of US Postage. $2,200. US U27, 3¢ star-die entire (USPOD watermarked with patent lines) tied lightly struck SCUPPERNONG / N.C. cds with May 27  in manuscript at center. This is the FIRST DAY of NC in the Confederacy and quite scarce. 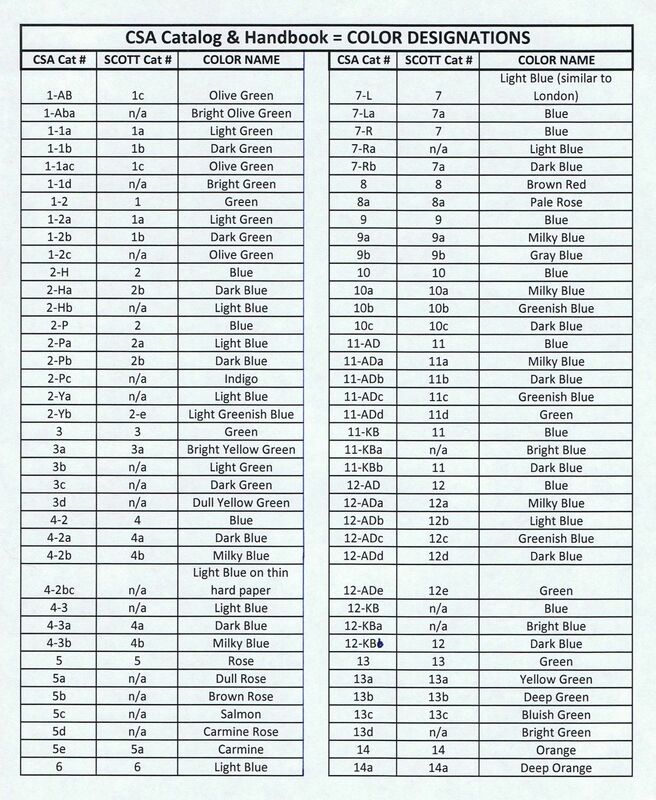 The Confederate Post Office Department took over on June 1, 1861, thus is easily the state with the shortest amount of time for Confederate Use of US Postage. 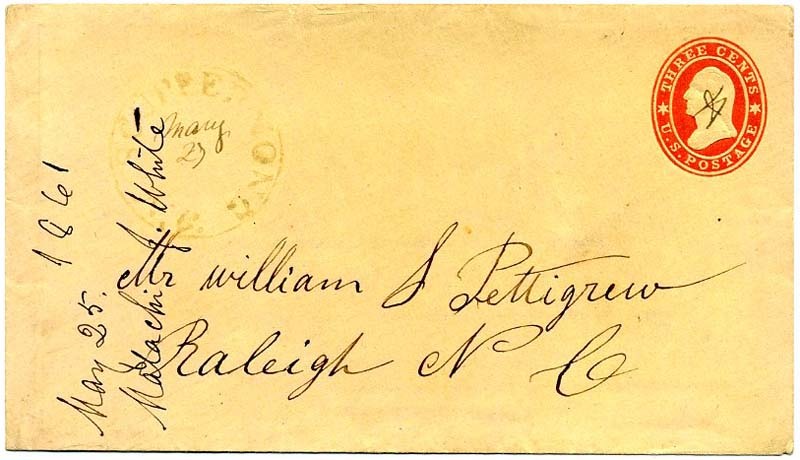 Addressed to William S. Pettigrew, Raleigh, NC and docketed as from Malachi J. White, May 25, 1861. Will be the subject of one of my columns. $2,000. William Shepard Pettigrew (1818-1900) and Malachi J. White were neighbors. White was enlisted by Pettigrew to oversee work at Pettigrew’s plantation while Pettigrew was in Raleigh serving as representative to the NC Secession Convention. Much more information on linked page. 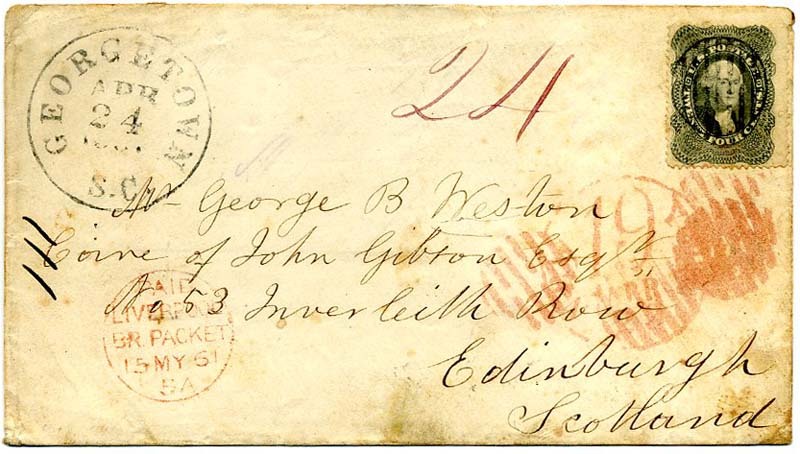 US 37, 24¢ gray lilac used on cover to George B. Weston, Care of John Gibson, No 53 Inverleith Row, Edinburgh, Scotland; origin cds of GEORGETOWN / S.C. // APR / 24 / 1861; stamp tied by red grid applied in New York with matching 19¢ New York credit circular datestamp, Liverpool transit, magenta "24", minor soiling, Very Fine, Confederate State Use of US Postage, with 1981 PF certificate which states two tiny tears at bottom which is serious description overkill (they are virtually invisible) and that “N.Y. ship was cancelled out since cover missed that ship and went via British packet.” Scarce and lovely use. SCV $5,000. $2,500. CHARLESTON / S.C. '24' // MAR / 8 / 1861, clear strike of cds with 24¢ integral due rating on folded letter to Messrs. John Jeffrey & Co., Edinburgh, Scotland; blue A. Tobias’ Sons company oval, "N. York Br. Pkt. '5' " integral exchange cds, although endorsed per Cunard Line Australasian, actually carried by Galway Line Adriatic from New York Mar. 13th to Queenstown arriving Mar. 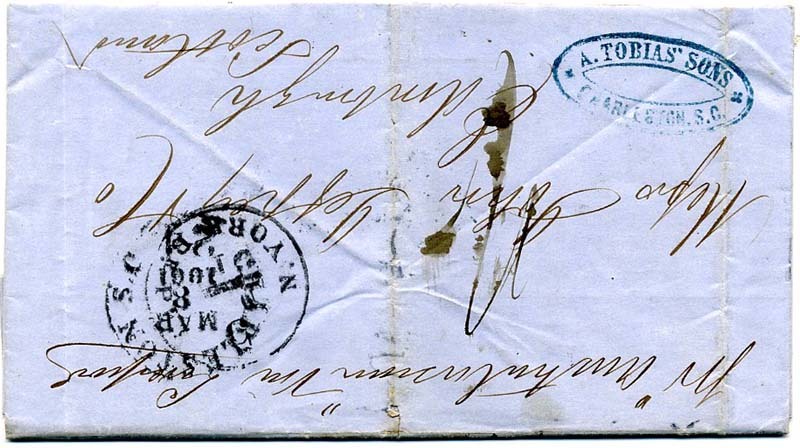 23rd; Edinburgh (3.25) backstamp and manuscript "1/-" shilling packet due rating; usual expected file folds. Letter written only four days after Lincoln took office, "…On 4th March President Lincoln of the United States delivered his Inaugural & from its tone regarded by many as a declaration of war. The commissioners from Southern Confederacy are now at Washington to demand the surrender of all the forts held by United States in our Territory & upon result this mission hangs either a peaceable separation or a bloody one. Since our last report the State of "Texas" has also seceded & joined the "Confederate States" & then "Arkansas" seceded, we will have all the cotton producing states with us…" The Cunard Liner Australasian broke down en route to New York and returned to Queenstown. Her mails were transferred to Arabia. Cunard Line engaged Galway's Adriatic to carry mails for the scheduled return trip eastbound. A RARE CONFEDERATE USE TO SCOTLAND WITH EXCELLENT CIVIL WAR CONTENT. US Postage Used in the Confederacy. $1,500. 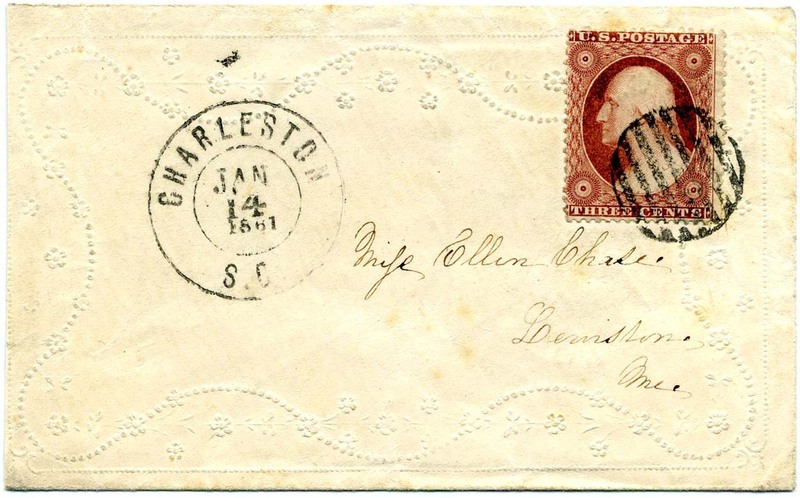 US 26, 3¢ dull red tied by grid duplexed with CHARLESTON / S.C. / Paid // FEB / 24 / 1861 integral Paid, Welch / Calhoun type AN-18 postmark on cover to “Mr. 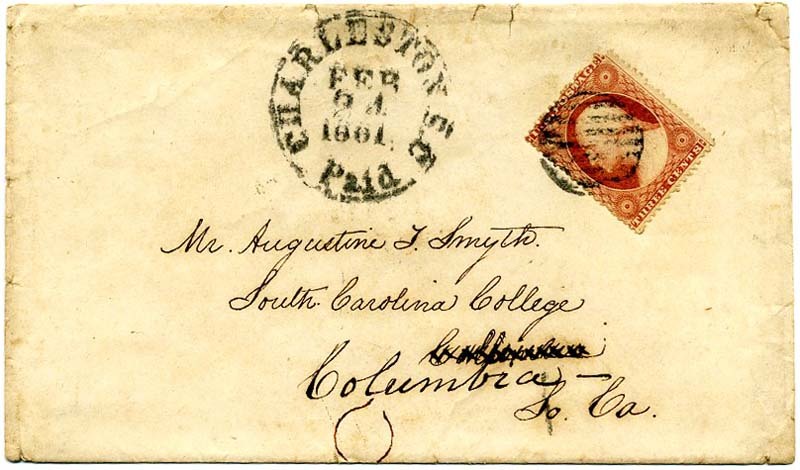 Augustine T. Smythe, South Carolina College, Columbia, So Ca. This old device was seldom used in the Confederate period. Cover a bit edge worn with small paper clip stain at bottom. CSA Use of US Postage. Ex Karrer. $225. Augustine T. Smythe (1842-1914) was a Signal Officer on the CSS Palmetto State, a Richmond class ironclad ram built at Charleston, South Carolina. US U27, 3¢ star-die entire to Wm. S. Pettigrew, Esq., Scuppernong, No. Ca. 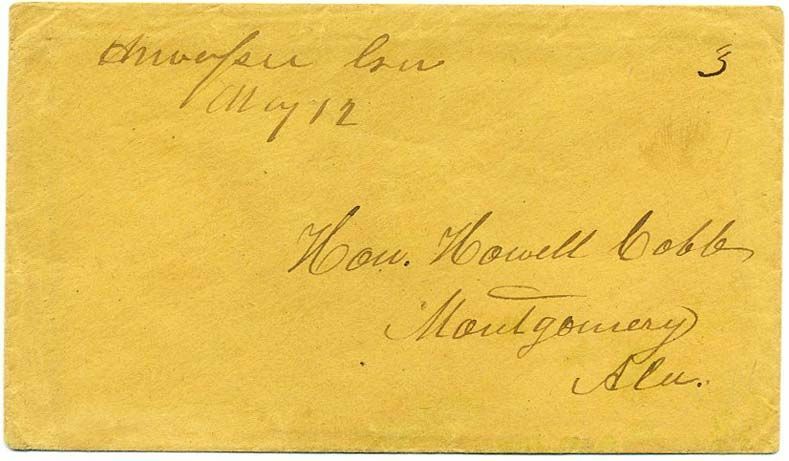 used with duplexed grid and CHARLESTON / S.C. // MAR / 25 / 1861 as well as red crayon “Due 3” for overweight letter, colorless fancy embossed business advertising of Butler & Bee, Charleston, S.C. Docketing up left side re sales and monies paid to William, Bee & Co., N. York. CSA Use of US Postage. Ex Karrer. $280. US U26, 3¢ star-die entire tied AUGUSTA / Ga. // MAR / 1  (inverted day date) addressed to Mrs. Isabella Woodruff, Care of Mrs. Roberts, Orphans House, Charleston, South Carolina where readdressed to Care of W. L. Easterlin Esq, Bamberg, S.C., C.S.A. 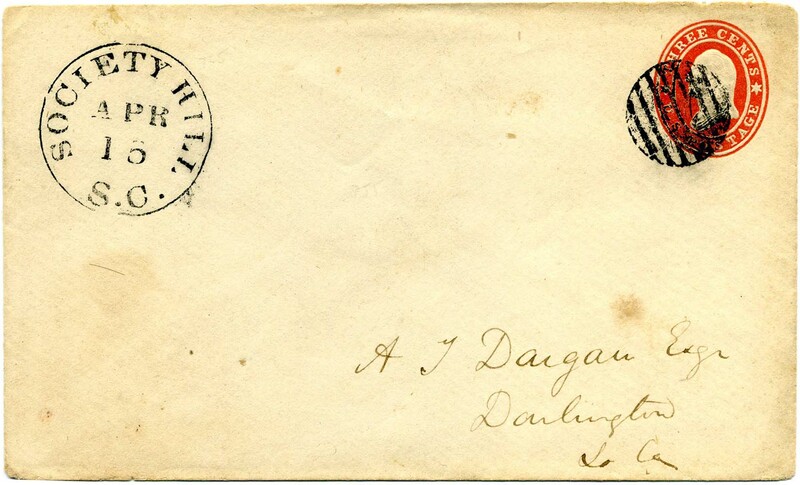 and FORWARDED with US 26, 3¢ dull red tied grid duplexed with CHARLESTON/ S.C. // MAR / 4 / 1861 dcds. The insightful Isabella Woodruff papers are in the Manuscript Division of Duke University. Isabella was a widowed slave holder and school teacher. The Charleston Orphans House is the oldest public orphanage in the United States, established in 1790 and in operation at that location until 1951 when it was moved to a more home-like setting for the children; it continues today. 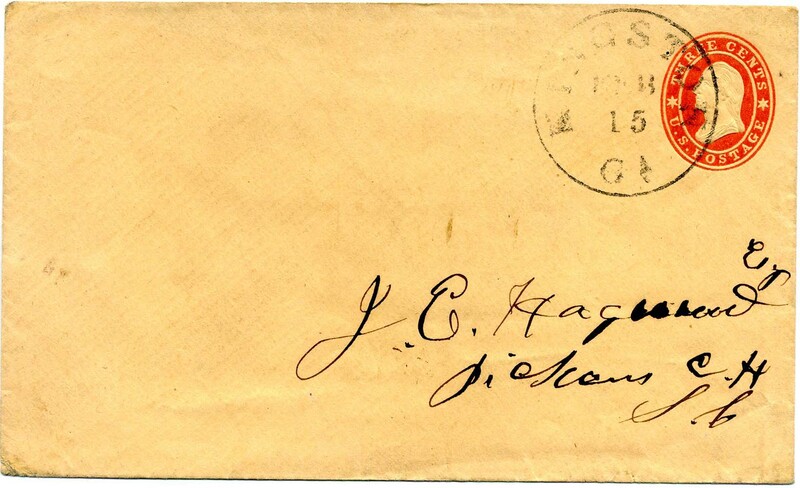 Stamp and cover with small faults, CSA Use of US Postage, Ex Karrer. $250. "Warsaw La. 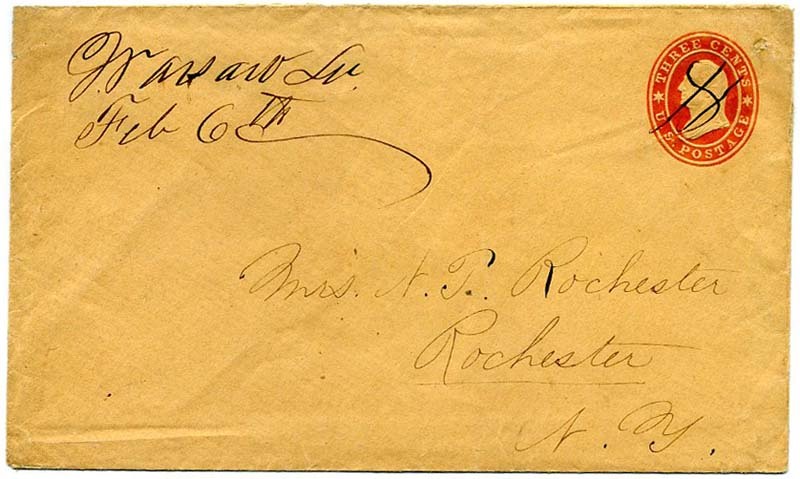 Feb. 6th" manuscript postmark on clean 3¢ Star Die entire #U27 to Mrs. N. P. Rochester, Rochester N.Y., cancelled by manuscript, sealed tear on back, Very Fine, Louisiana was admitted to the Confederacy only two days before this was sent. Nice CSA Use of US postage. Listed in the CSA Catalog with CV of $300. $200. 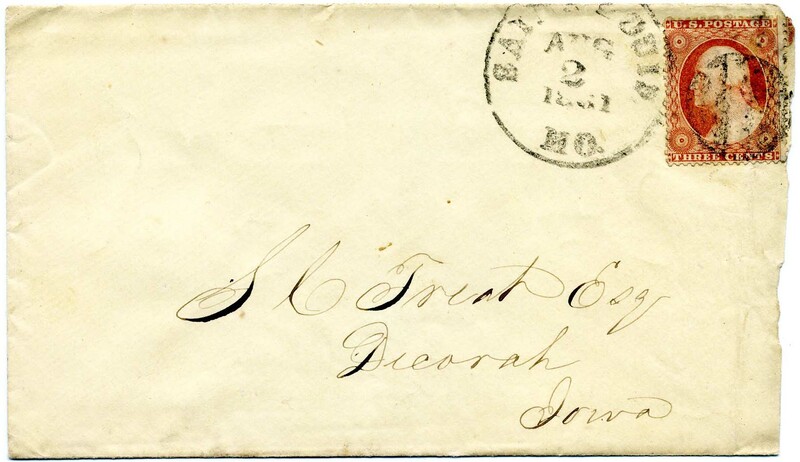 US 26, 3¢ dull red tied SAVANNAH Ga // JAN / 18 / 1861 cds and grid cancel on cover to Isabell A. Woodruf, Charleston SC in the care of Mrs Robirts (sic) Olphin (Orphan) House with a manuscript “10” of unknown meaning. Independent State Use. CCV $200. Slight back flap faults. Nice use. $180. 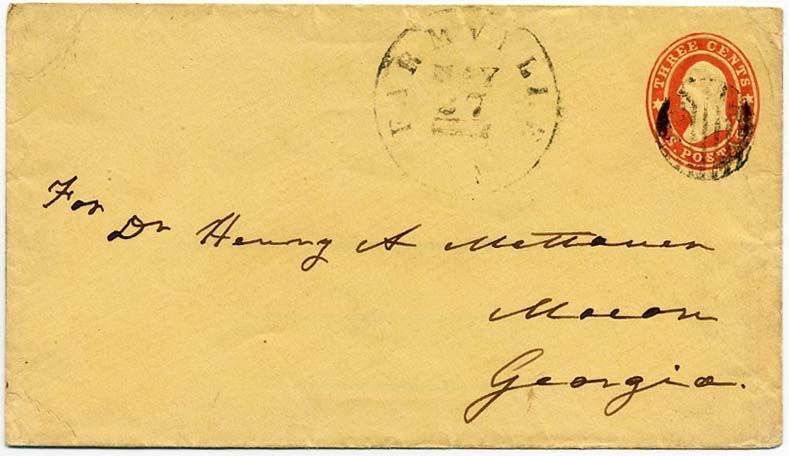 US 3¢ star-die entire #U27 tied with grid and matching CHARLESTON / S.C. // JAN / 30 / 1861 cds, addressed to Orangeburg C.H., S.C. Part of back flap missing otherwise Very Fine Independent State Use, ex Kohn. (CCV $200). $200. US 26, 3¢ dull red tied SAVANNAH / Ga. // APR / 12 / 1861 cds on cover to Hon. Howell Cobb, Montgomery, Alabama while he was President of the Confederate Provisional Congress in Montgomery, Ala.; bottom left corner with wax seal toning and slight impression of an affixed 3-cent coin; reverse with initial SAVANNAH Ga. // APR / 6 / 1861 duplex cds; Wonderful U.S. Used in the Confederacy on the FIRST DAY OF THE CIVIL WAR - a perfect exhibit lead-in. $500. CSA Major General Howell Cobb) was an illustrious U.S. and Confederate politician, chairman of the convention of delegates from the seceded States and a brigadier general in the Confederate Army. US 26, 3¢ star-die tied RICHMOND / Va. // MAY / 17 / 1861, CSA Use of US postage, addressed to E& I Harding, Pleasant Grove, Va. $250. 3¢ Star-die entire #U27 tied GRENADA / Miss. 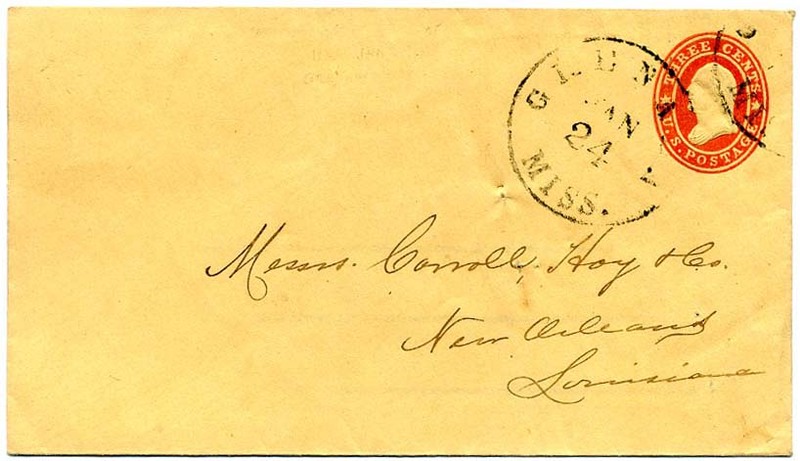 // JAN / 24  cds, to Messrs. Carroll Hoy & Co., New Orleans, fresh with usual filing pin holes for this correspondence, watermarked with patent lines, Independent State Use listed in CSA Catalog with CV of $500. $450. 3¢ Star-die entire #U27 tied HOLLY SPRINGS / Miss. 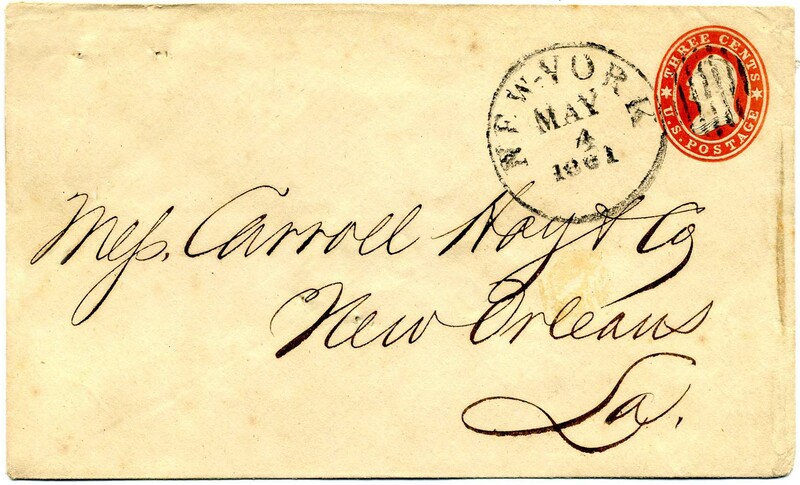 // APR / 16  to Messrs. Carroll Hoy & Co., New Orleans, fresh with usual filing pin holes for this correspondence, watermarked with patent lines, Confederate State Use, listed in CSA Catalog with CV of $250. $200. 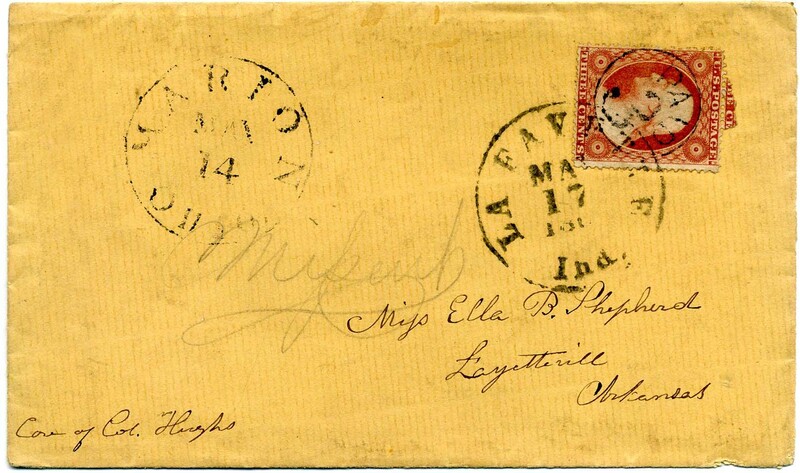 3¢ dull red #26 used with MARION / OH // MAY / 14  cds on cover to Miss Ella B. Shepherd, Lafayetteville, Arkansas, during INDEPENDENT STATE PERIOD, with ms. directive “Care of Col. Hughs” at lower left as well as penciled “Missent” and stamp canceled b and LAFAYETTE / Ind // MAY / 17 / 1861 cds with original 2-page letter from Ella’s mother saying, in part, “The last we received from you was the first of last week written soon after you heard of the attack on Fort Sumpter (sic). We hear the news from Arkansas by the papers. We feel exceedingly anxious to hear from you as we do not know exactly where you are. K know so little about how you are situated that I do not know what to advise. I wish you were at home but it would not be safe for you to come unless you had good company.” Also mentions a friend’s husband at Camp Dennison near Cincinnati and says, “Mr. G. is an officer. They were exposed in the rain 2 days & nights after reaching there without any shelter owing to the mismanagement of those who duty it was to make preparations for the companies as they arrived.” Very Fine. Ex Clippert. $375. “Oak Grove Ark Mach 20th” all in manuscript on 3¢ star-die #U27 with no evidence of Confederate postage rate. 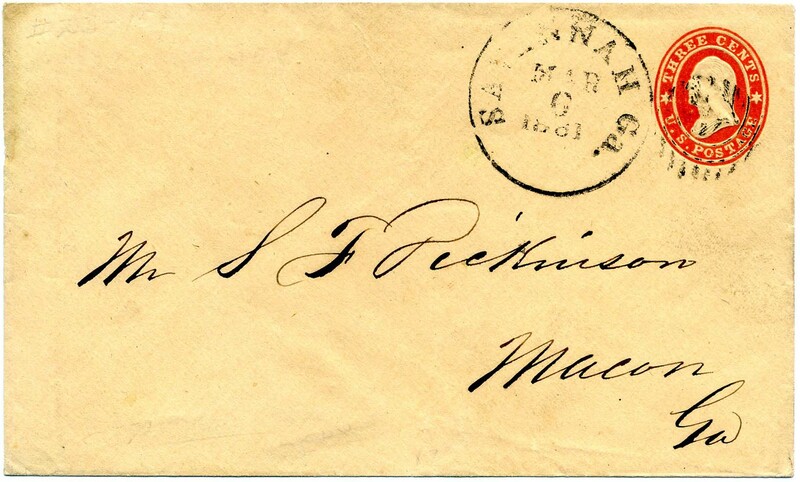 Docketing of “1862” at left which leaves current postal historians with a dilemma. If it is indeed 1862, then there is a missing rate. However, it is not impossible that the docketing should have been 1861. Either way, this is a Confederate use as Arkansas seceded May 6, 1861 and joined the Confederacy May 18, 1861. Interesting use UNLISTED IN ROBERTS CENSUS EITHER WAY. Slightly reduced at left and top as well as replaced bottom right corner; addressed to [Rev] A. R. Banks, Tulip, Dallas Co Arkansas, Ex Marcus White and George Clippert. $450. Rev. A. R. Banks organized the Tulip Presbyterian Church around 1840. The original Church building was destroyed in 1959 by a tornado, and was rebuilt the same year. Banks divided his time between the Tulip and Princeton congregations. US #26, 3¢ dull red tied boldly struck neat MOBILE / ALA // MAY / 21 / 1861 double circle on small narrow blue-lined cover to Miss S. M. Hayt, Care William Curtis Esq. No 98 East 15th Street, New York; small sealed cover tear at lower left. CSA Use of US Postage. $150. 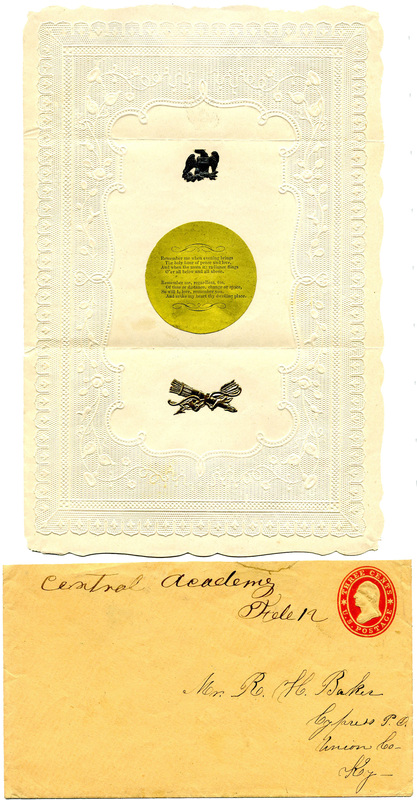 U27, 3¢ star-die entire used with “Central Academy [ Miss] / Feb 12 ” manuscript cancel, addressed to Mr. R. H. Baker, Cypress P.O., Union Co., Ky.; sealed flap opening tears extending over top. Listed CSA Use with CSA Catalog Value of $300. Embossed Valentine enclosure with romantic verse on center wafer. $600. US U27, 3¢ star-die, tied neat KINGSTON / GA. // FEB / 15  cds on USPOD watermarked entire to J.E. Hagood, Esq., Pickens C.H., S.C. Confederate Use of US Postage. Plantation Collection. $250. James Earle Hagood was in the mercantile business and Clerk of Circuit Court during the War, frequently called upon to perform services for soldiers away in the army and their families. More information on the linked page. 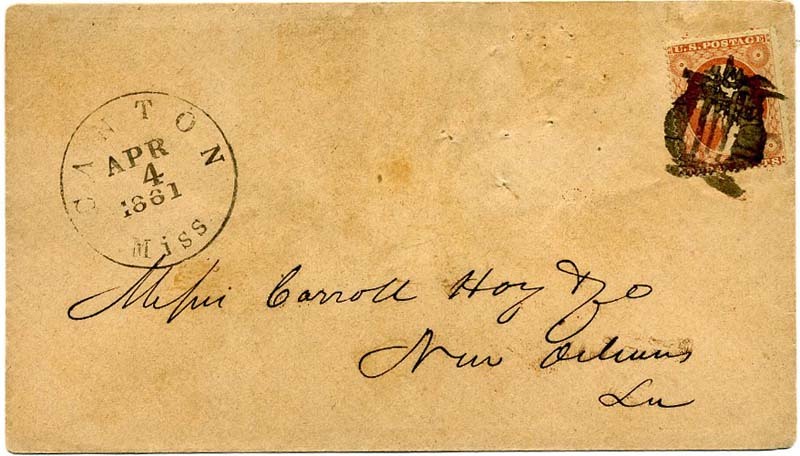 US U27, 3¢ star-die, tied by bold ?VILLE / MISS // APR / 17 /  cds on pristine USPOD watermarked entire, Carroll Hoy correspondence with usual pin holes, part of back flap missing, Confederate Use of US Postage. 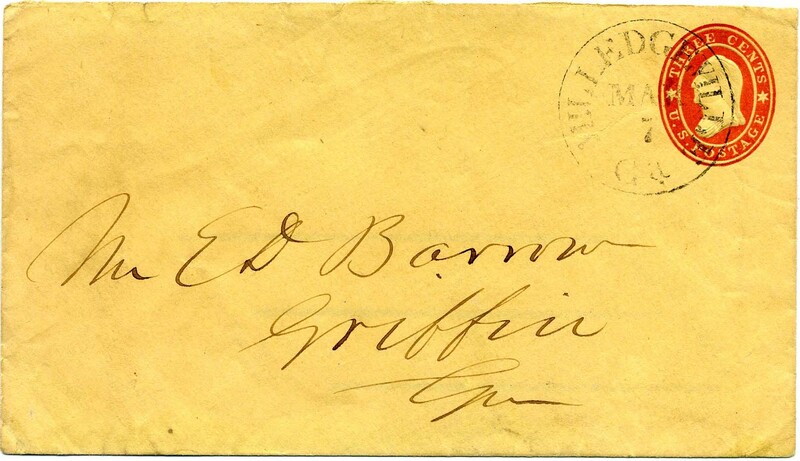 A Mississippi collector will doubtless correctly identify this postmark. Ex Whittle and Plantation Collection. $300. US 20, 1¢ blue type II, Plate 12, plus two singles US 24, 1¢ type V - MIXED FRANKING - tied by double strike of MONTGOMERY / Ala. // MAY / ? / 1861 circular date stamp; both the #20 and one of the #24s have pre-use sealed tears. Tied on cover to Capt. Jno. W. A. Sanford, Quarter Master C.S., 3rd Ala. Regt. 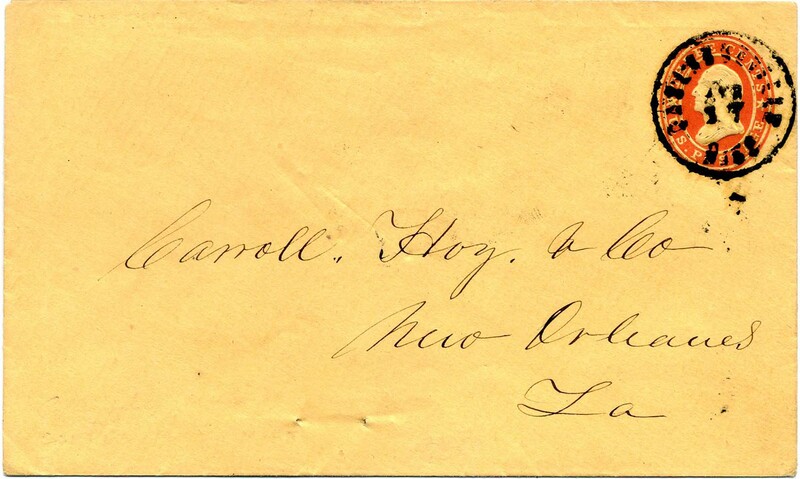 Norfolk, Va. Stanley Ashbrook description on verso stating, “1¢ 1857 Type V plus Plate 12. From Montgomery, Ala, to a Captain in the Confederate Army. 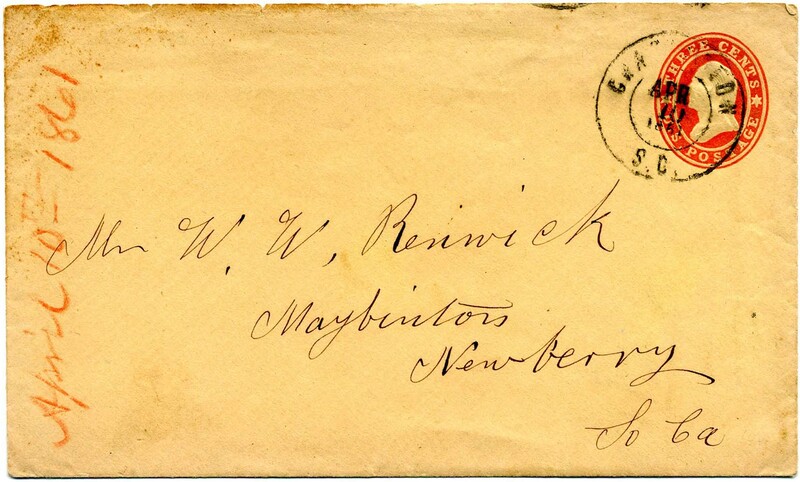 Montgomery Date May 12, 1861 After Alabama Seceded.” While I am more uncertain as to the day of the month than Ashbrook, it is clear that this is Confederate Use of US Postage and, from my research on the officer / rank, likely that Ashbrook is correct or at least close to the exact date. QUITE SCARCE CSA USE OF US 20. Ex Ashbrook and Plantation Collection. SCV $1,000. $850. John William Augustine Sanford was a colonel 60th Alabama infantry regiment, Gracie’s Brigade, Johnson’s Division, Anderson’s Corps, Army of Northern Virginia, Attorney General of Alabama, lawyer, and clerk of State supreme court. Much more information on the linked page. US U9, 3¢ Nesbitt, tied ENTERPRISE / MISS // MAY / 2? 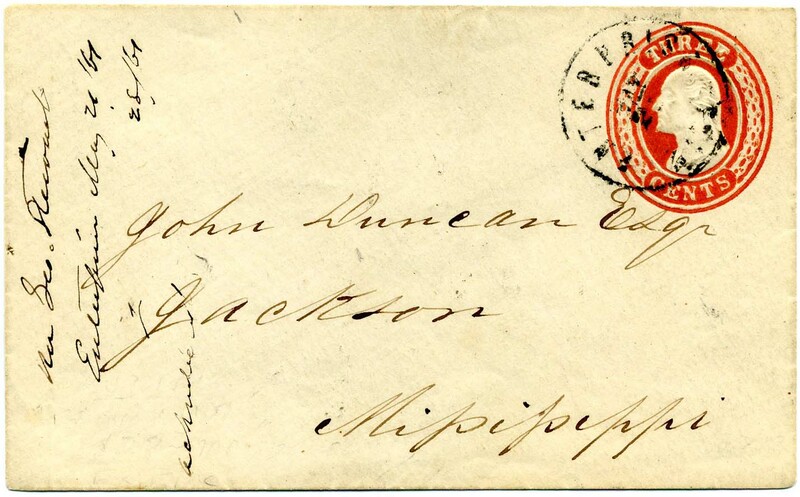 / 1861 on clean entire to John Duncan, Esq, Jackson, Mississippi. Docketing up left side indicates correspondent was George Stewart. Nice CSA Use of US Postage. Plantation Collection. SCV $250. $270. 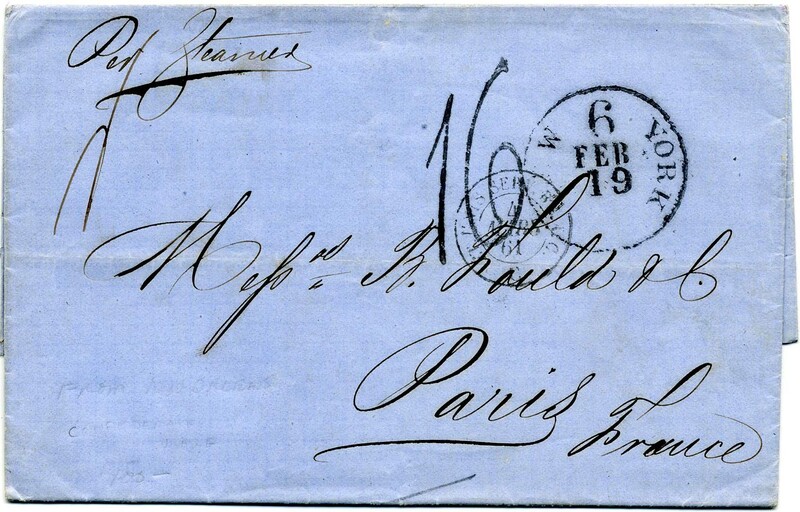 NEW ORLEANS pristine folded business letter in French headed 12 February 1861 to Messrs B. Fould & Co., Paris, France, through New York // 6 / Feb / 19  "Et. Unis Serv. Br. A.C. / 4 / Mars / 61," French transit datestamp and "16" decimes due handstamp, Paris receiving backstamp, Extremely Fine. 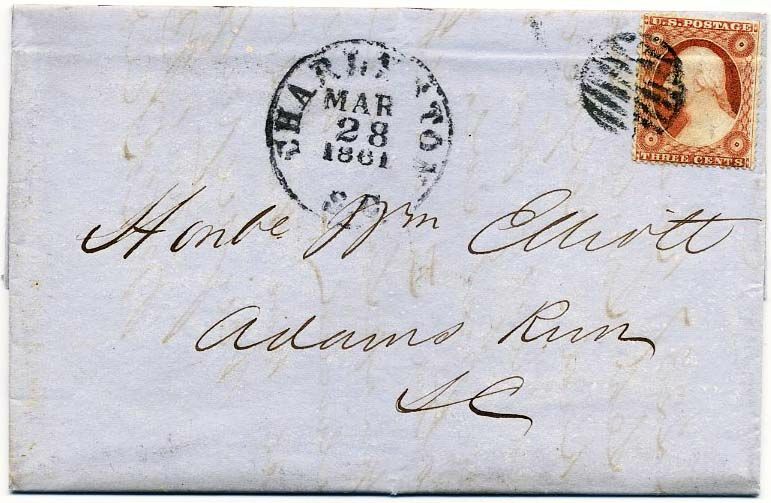 Choice TRANS-ATLANTIC CONFEDERATE USE OF US POSTAGE carried on Cunarder Arabia, which departed New York on February 12 and arrived at Queenstown on February 23. Plantation Collection. $750. 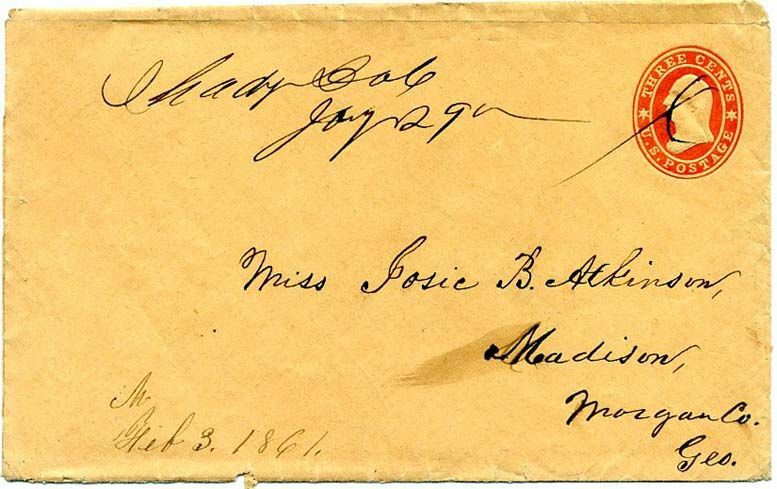 US 26, 3¢ dull red tied grid with matching CHARLESTON / S.C. // JAN / 14 / 1861 double circle postmark on small embossed ladies cover to Miss Ellen Chase, Lewiston, Me, very slightly reduced at left. Lovely Independent State Use. $350. US U27, 3¢ star-die tied neat light MILLEDGEVILLE / Ga. // MAR / 7  cds on neat entire with patent lines, addressed to E. D. Barrow, Griffin, Ga., nice CSA Use of US Postage. $180. 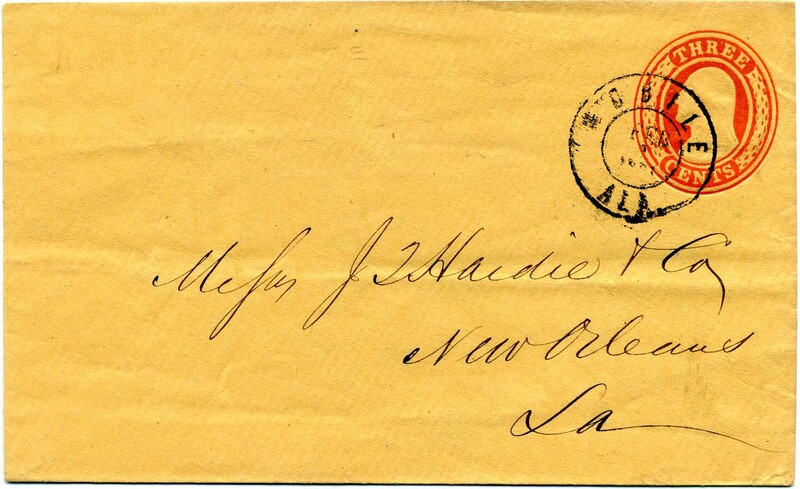 US U10, 3¢ Nesbitt tied bold MOBILE / ALA // FEB / 1 / 1861 double circle postmark on pristine watermarked entire to Messrs. J. T. Hardie & Co, New Orleans, nice Independent State Use. John T. Hardie was a prominent cotton factor and businessman. $260. 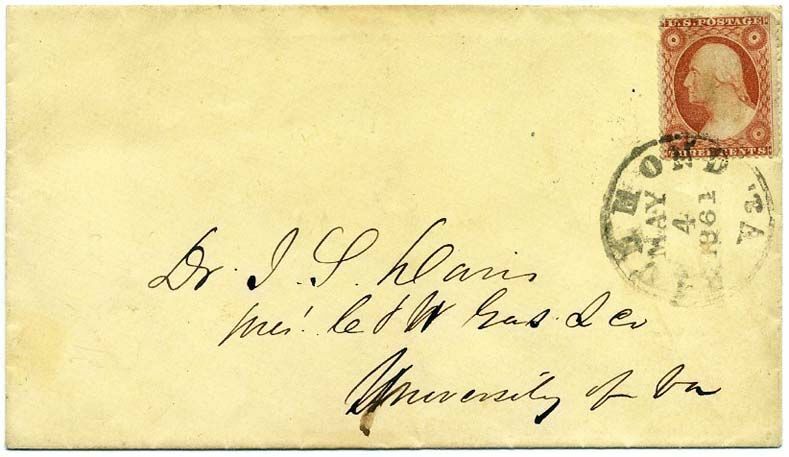 France, 80¢ rose (Scott 20) Emperor Napoleon III on colorful incoming Trans-Atlantic cover to Confederate New Orleans; posted from Bordeaux, France, on March 12, 1861, tied diamond grid, with backstamp of Paris & Calais March 13, 1861, red “Br. Service” framed cancel for British packet service; boxed “PD,” received at Boston with red PAID 15 cds on April 1; addressed in French to “Monsieur Woolongham, Eugene, Captaine de Navires, Rue du Quartier 160, Nouvelle Orleans”; red manuscript “3” to the right of the postage stamp is the French credit to the United States of 3-cents. Of the 15-cent convention rate (paid with the 80-centimes stamp), the United States was entitled to only 3-cents since a British packet carried the letter from England across the Atlantic. Slight wear and soiling but rare inbound Confederate use with possible carrier service to a street address. Unidentified marking at top--New Orleans? $1,000. Eugene Woolongham (also seen as Woolingham) was the Ship Captain of the Brig Minatitlan which usually sailed between New Orleans, Vera Cruz and Tampico, Mexico. 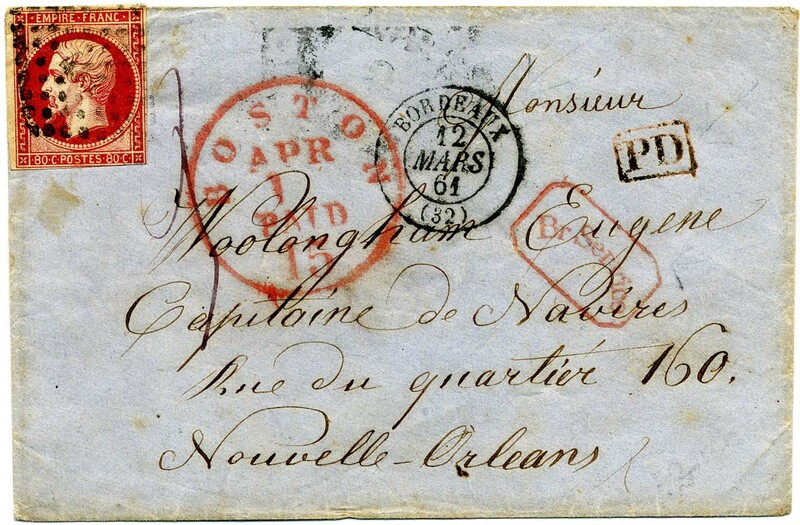 France, 40¢ orange (Scott 18) Emperor Napoleon III on colorful incoming Trans-Atlantic outer folded lettersheet (no content) to Confederate New Orleans; posted from Bordeaux, France, on February 24, 1861, tied diamond grids, with backstamp of Paris February 21, 1861, red “Br. Service” framed cancel for British packet service; red manuscript “3” at left is the French credit to the United States of 3-cents. Of the 15-cent convention rate (paid with the two 40-centimes stamps), the United States was entitled to only 3-cents since a British packet carried the letter from England across the Atlantic. 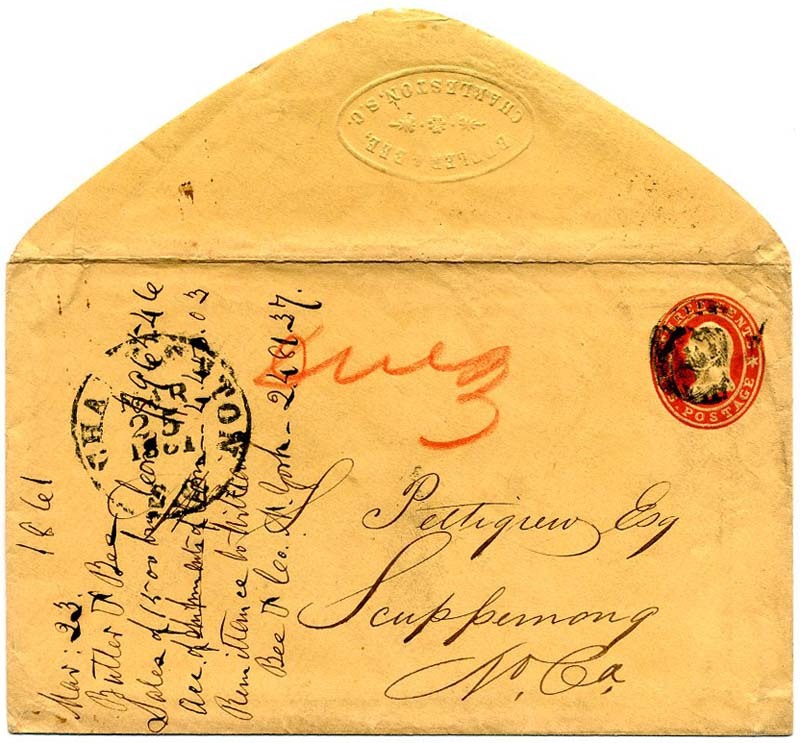 Boxed “PD,” received at Boston with red PAID 15 cds on March 11 (Cunard steamer Niagara); addressed in French to “Monsieur Le Consul de France, a New Orleans;” minor opening tears on verso. Count Eugène Méjan was French counsel at New Orleans from 1856 to 1863. He was very pro-Confederate. Lovely and rare inbound Confederate use. $1,000. US 26, 3¢ star-die entire tied CHARLESTON / S.C. // APR / 10 / 1861 double circle datestamp, to W. W. Renwick, Maybinton, Newberry, So. Ca. FEWER THAN 5 COVERS REPORTED TO MAYBINTON AS A DESTINATION, Ex Littlejohn and Wayman. Nice CSA Use of US Postage. $150. 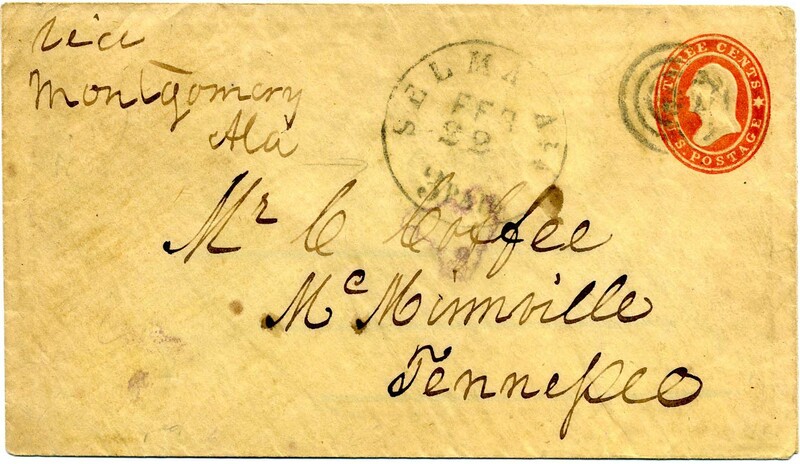 3¢ star-die entire #U27 with patent lines and USPOD watermarks, tied by target with matching SELMA / ALA / 3 PAID // FEB / 22 / 1861] pre-war cds, to C. Coffee, McMinnville, Tennessee via Montgomery, Ala. Confederate Use of U.S. Postage. CCV $250. Ex Daniel C. Warren. $250. 3¢ star-die entire #U27 with USPOD watermarks, tied by grid and matching BATON ROUGE / La. // MAR / 3 (?) 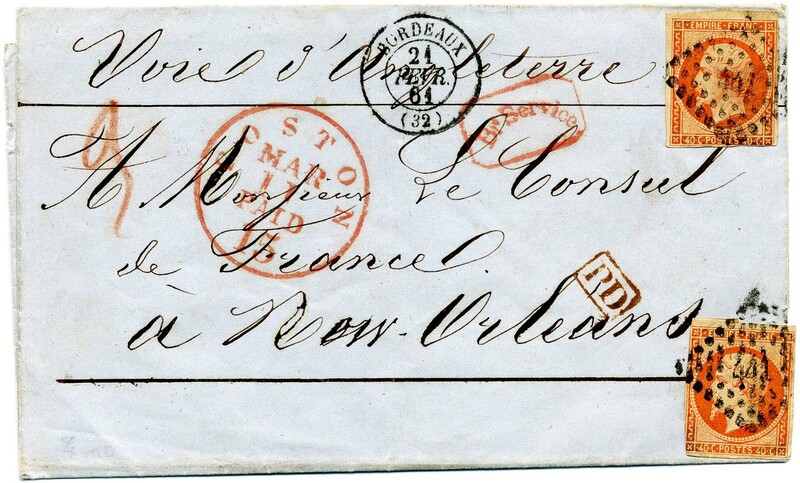 1861 cds to Messrs. J. T. Hardie & Co., N. Orleans, La. 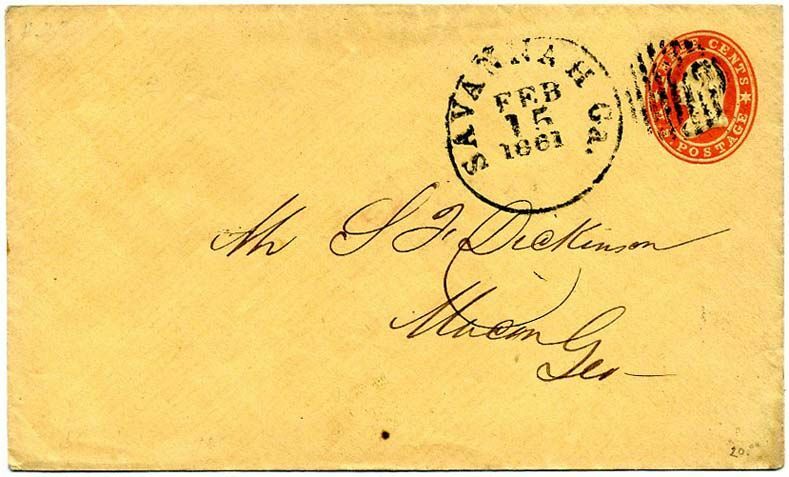 Confederate Use of U.S. Postage. Sealed flap tear and trivial nick at upper right, CCV $300. Ex Daniel C. Warren. $250. 3¢ star-die entire #U26 with USPOD watermarks, tied by straightline PAID with matching VICKSBURG / MISS // MAR / 12  double circle datestamp. 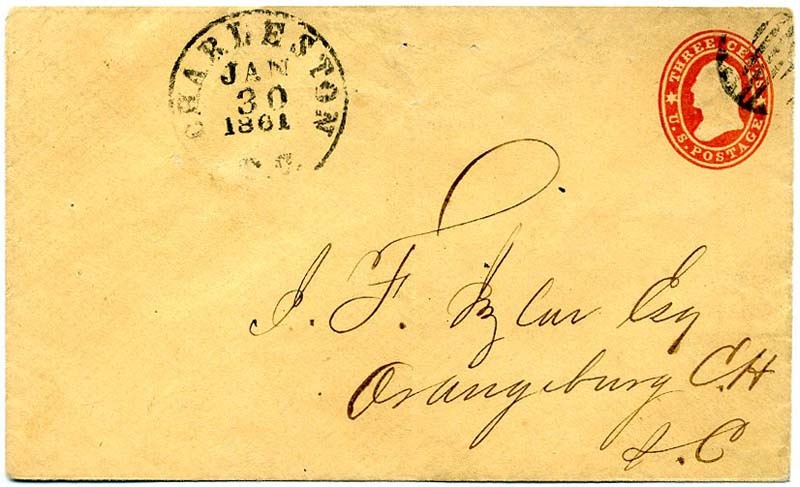 Confederate Use of U.S. Postage. 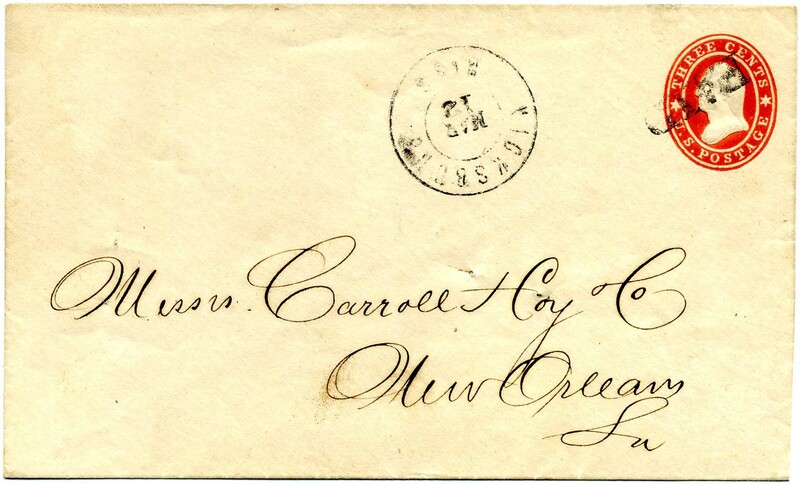 The well-known Carroll Hoy & Co., New Orleans correspondence with the usual pin holes found on all of this correspondence. CCV $250. Ex Gallagher and D.C. Warren. $260. 3¢ star-die entire #U26 with USPOD watermarks, tied by boldly struck grid and matching clear SOCIETY HILL / S.C. // APR / 15  cds to A. T. Dargan, Esq., Darlington, S.C. 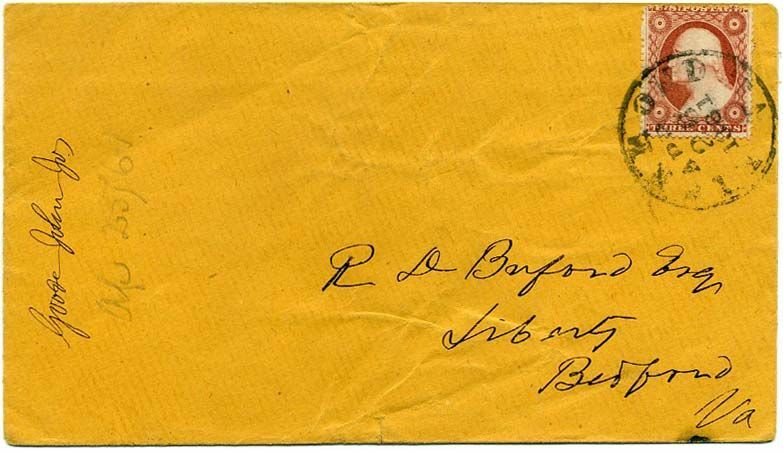 Sealed opening flap tear, pencil docketing on verso that letter is from W. H. Evans inquiring about Binnet (sic) charity fund. 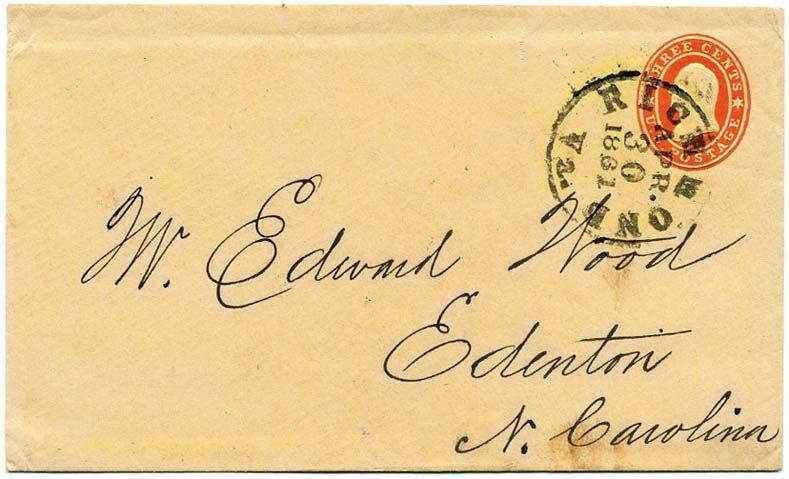 Confederate Use of U.S. Postage. Ex D.C. Warren. CCV $300. $325. 3¢ star-die entire #U27 with USPOD watermarks, tied by grid and matching SAVANNAH Ga. // MAR / 6 / 1861 cds to S. F. Dickinson, Macon, Ga. Confederate Use of U.S. Postage. Ex D.C. Warren. CCV $200. $225. 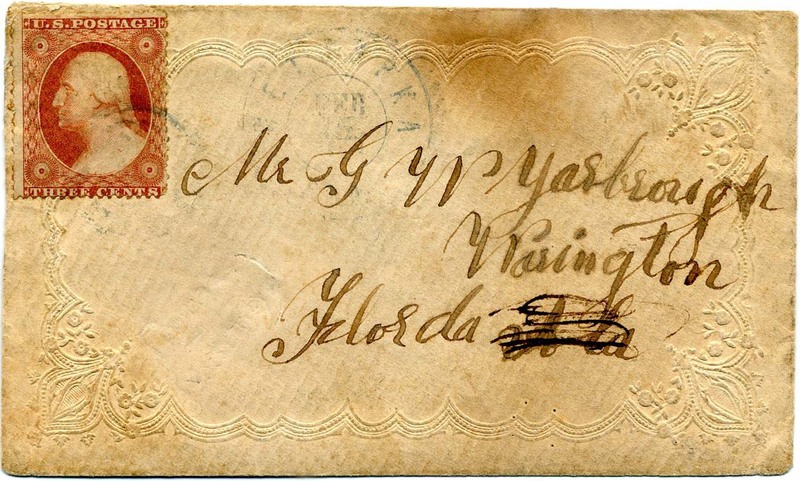 3¢ dull red #26 tied by strike of unclear WETUMPKA / ALA // FEB / 15 / 1861 double circle datestamp with second clear strike at right, used on delightful embossed ladies cover to Mr. G. W. Yarborough, Warrington, Florida (misspelled), Confederate Use of U.S. Postage. 1988 CSA certificate. Ex D.C. Warren. CCV $350. $400. 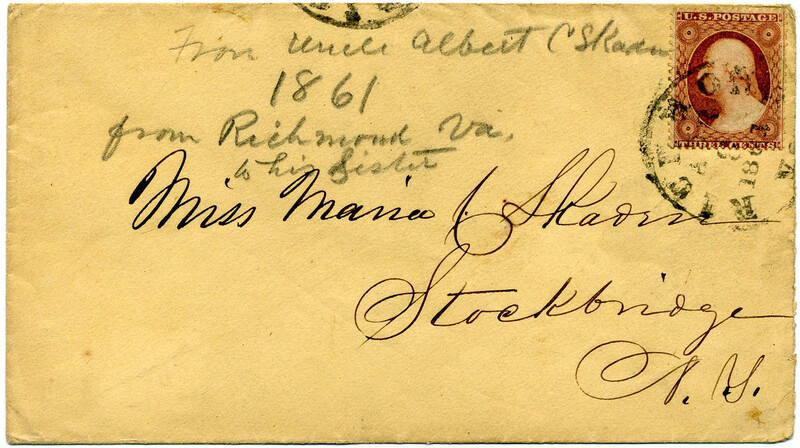 US 3¢ dull red #26 tied RICHMOND / Va. // APR / 8 / 1861 on cover from Albert C. Skaden to his sister Maria Skaden in Stockbridge, NY, mailed nine days before Virginia seceded. Accompanied by nice article by the late Herbert P. McNeal in a 2000 AP about the Skaden correspondence, much of which originated in Florida. $180. 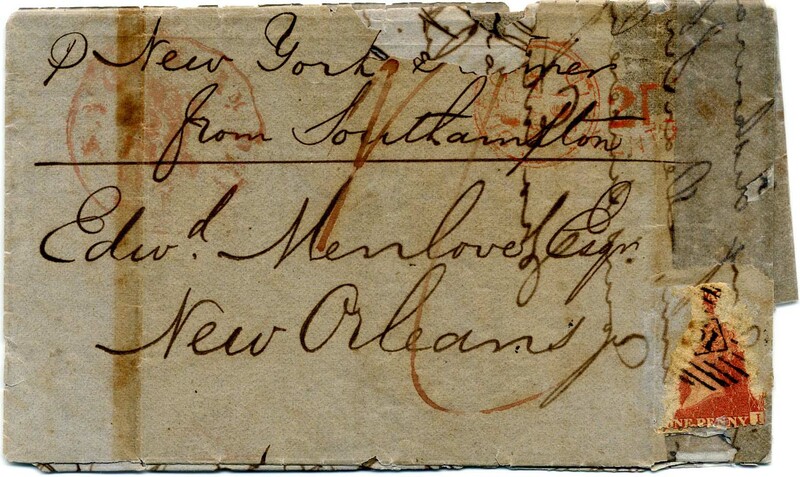 Incoming trans-Atlantic folded letter from London to New Orleans bearing portion of 1d British stamp with barred numeral cancel, ms. “P[er] New York Steamer from Southhampton” to Edwd. Menlove, Esq., New Orleans, La. CSA Use of US postage period. 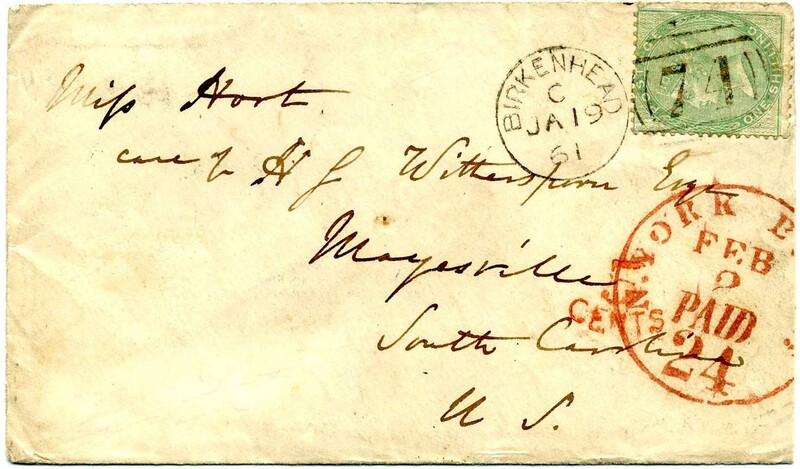 Although President Lincoln ordered a naval blockade against Southern ports on April 19, 1861, the letter, mailed on May 14, 1861, was forwarded by the USPO to the CSA per agreement between the two warring nations before the blockade become effective. Letter extensively deteriorated with adhesive tape repairs to file splits. Ex Kaplan and Fisher. $325. US 3¢ star-die entire #U27 tied NEW ORLEANS / LA // FEB / 2  during scarce Independent State Use period, only two days prior to formation of the Confederacy. Louisiana had a very short period as an independent state, having seceded on January 26 and admitted to Confederacy February 4, 1861. 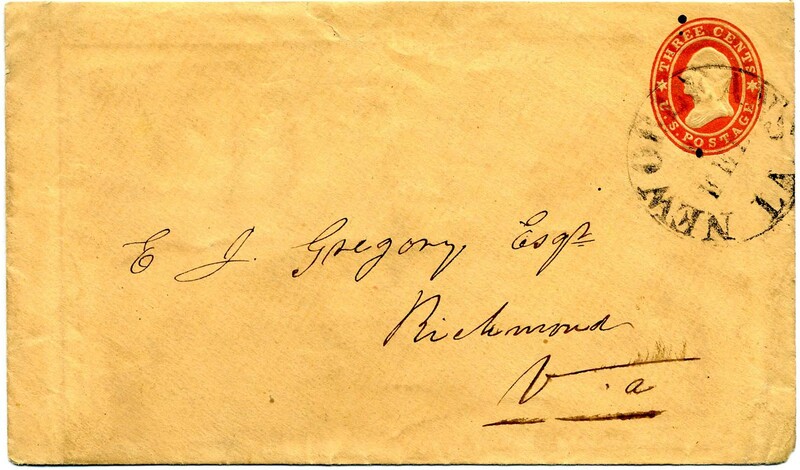 Addressed to E. J. Gregory, Esqr., Richmond, Va. Listed in CSA catalog with CV $300. Slightly reduced at top, sealed tear at top and top back flap missing. Ex Fisher. $375. US U26, 3¢ star-die entire tied NEW-YORK // MAY / 4 / 1861 duplex, to Mess. 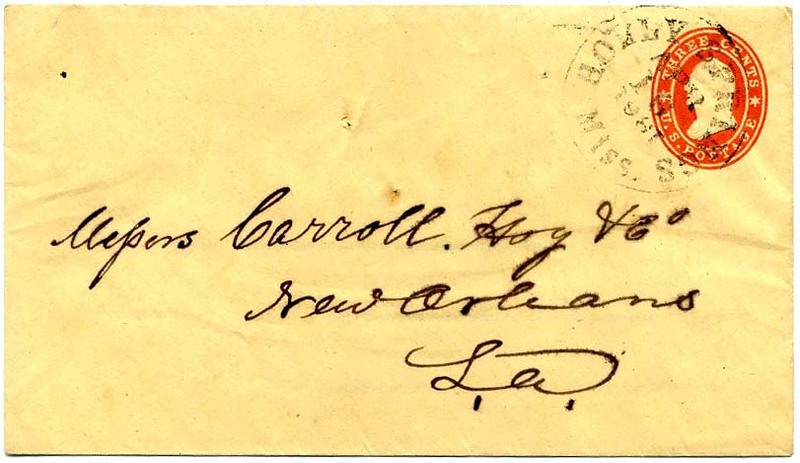 Carroll Hoy & Co., New Orleans, La., with filing pin-holes at upper left usual to this well-known correspondence, sealed flap tears. CSA Use of US Postage. Ex Fisher. $250. US 26, 3¢ dull red tied by SAINT LOUIS / MO. // AUG / 2 / 1861 cds on cover to S. C. Treat Esq, Decorah, Iowa; slightly and irregularly reduced at right. Missouri was a border state that sent men, armies, generals and supplies to both sides, had governments representing each side and more. It seceded October 31, 1861, and was admitted to the Confederacy November 28, 1861. While there may be an example of independent state use from Missouri, none is listed in the CSA catalog. Most who want Missouri represented in their Confederate collections do so by with one of the few POW covers from Gratiot Street Prison in Saint Louis, which housed Confederate prisoners. Ex Fisher. $230. LETTER headed DECEMBER 21, 1860 from Charleston from C. J. Cudworth to her brother Arthur G. Cudworth in Adams Run, So Ca – hand-carried cover “Politeness of Mr. McGee.” She writes, in part, “I presume you have heard that the State has seceded.” The State officially seceded from the Union the evening previous, after the post office had closed. 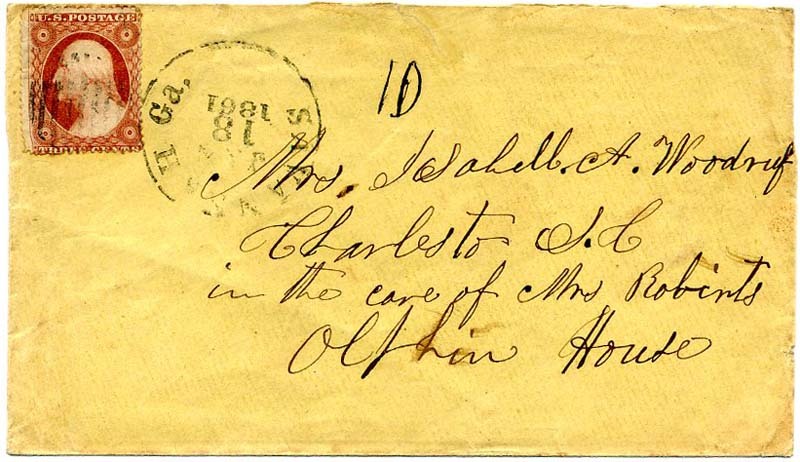 So, this was actually “POSTED” THE FIRST DAY THE LOCAL POST OFFICE OPENED IN THE NEWLY INDEPENDENT SOUTH CAROLINA. 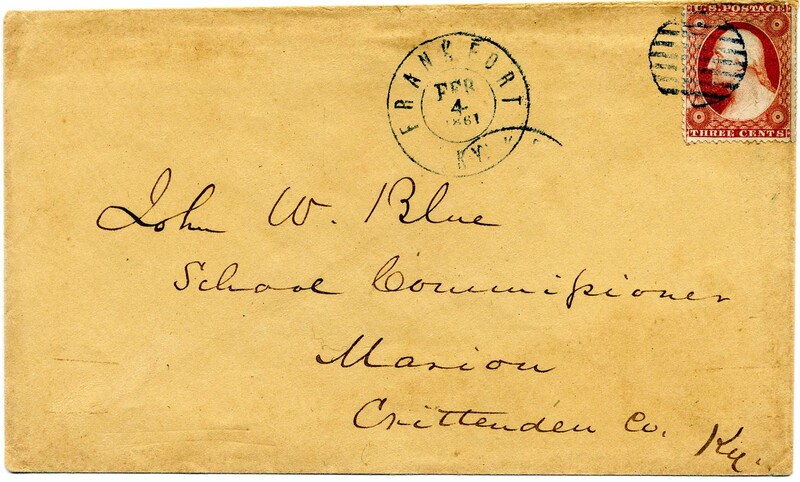 This is the beginning of the period that defines the collecting of Confederate postal history. Ex Karrer and Fisher. Arthur G. Cudworth served as a 2nd Lieut. in Co. I, 27th Regt SC Volunteers. $450. 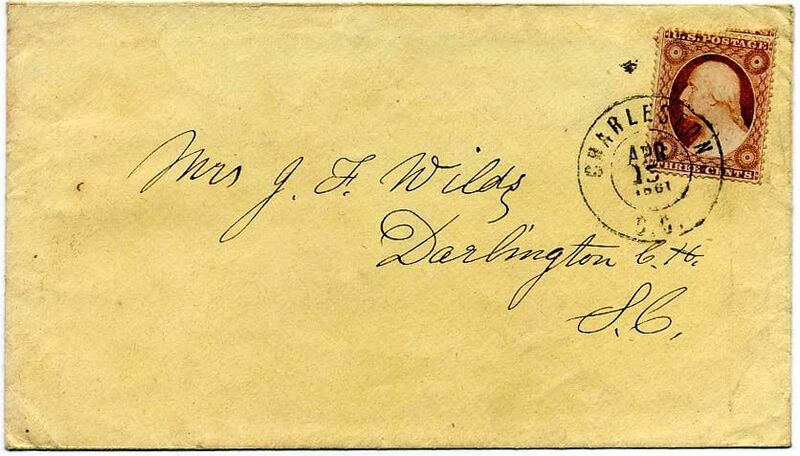 US 26, 3¢ dull red tied CHARLESTON / S.C. // APR / 15 / 1861 dcds on cover to Mrs. J. F. Wilds, Darlington C.H., S.C. the day that troops commanded by Major Robert Anderson depart Fort Sumter for New York. CSA Use of US Postage. $450. Incoming Trans-Atlantic use to Independent State of South Carolina from Birkenhead, England. 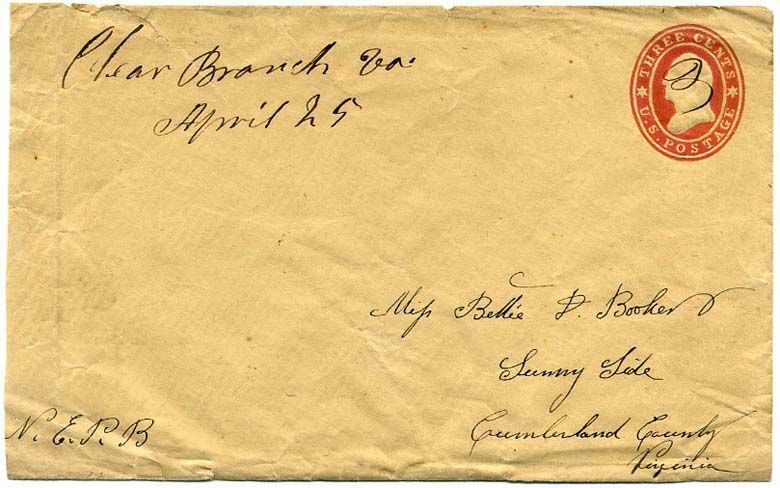 Franked with GB 1s green (#28) with tiny pre-use faults, tied by BIRKENHEAD / c // JA 19 / 61 duplex, Liverpool oval backstamp and perfectly struck bold red “5 CENTS” credit handstamp. Carried by Cunard Line Arabia from Liverpool Jan 19, 1861, to New York with N. YORK BR. PKT. // FEB / 2 // PAID / 24 bold red exchange CDS. Lovely use addressed to Miss Hort Care of H. J. Witherspoon Esq. Mayesville, South Carolina, U.S. (which it was no longer). $500. US 26, 3¢ dull red cancelled by grid on embossed Valentine cover to Miss Mag Cranford, Columbia, So Ca. with delightful ornate original Valentine enclosure “To Miss Mag” dated “Athens Ga 14th Feb 1861” and opening “O Idol of my dreams!” Top back flap missing and some back-flap adhesions of little consequence, 1980 PF Certificate. 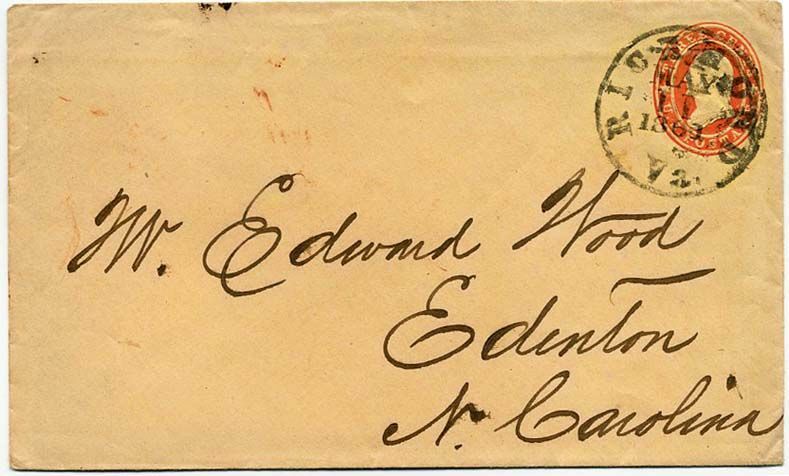 Rare Confederate State use of US postage on a Valentine, difficult to find covers and Valentines which truly belong together. A total charmer! $750. Kentucky initially tried to remain neutral, but it was much more complicated in practice than in principle. John William Blue, Sr. biographical information on linked page.